Welcome to HTBomb's Magical Slideshow & Pics page. Here you'll find a a few of my favorite photos as well as a slideshow for your viewing pleasure. Enjoy. Rare magenta paint. Probably the rarest and hardest to find car in my collection sold to someone who opened it. Go figure. The Spoilers series is my favorite. Exposed engines and aggressive stances was popularized by the likes of "Big Daddy" Ed Roth in his popular hot rod drawings. 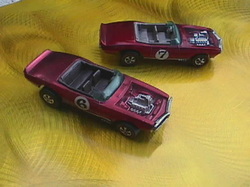 Many Hot Wheels cars have names that are plays on words or popular phrases. For example, Rocket-Bye-Baby and Sugar Caddy . A few years before this car came out The Doors had a hit with "Light My Fire". The Hot Wheels Four-1 is a custom design along the lines of a Smart car. The black paint and wing-like rollbar extension reminded me of the Batmobile. 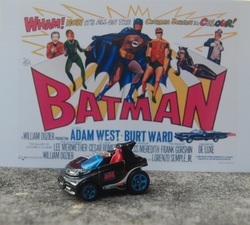 The blue windshield recalls one of my favorite toys: the Corgi #267 Batmobile from the '60s TV series; the blue wheels allude to the glowing hubs on the Batmobile from Batman Forever. I removed most of the graphics from the side and the racing number from the rollbar. The finishing touch was the bat sticker on the door for a nice retro touch. 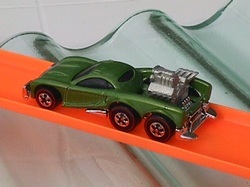 One of my first customs was based on the Hot Wheels Tow Jam and it's my bid for a Hot Wheels The Spoilers II series. Diecast engine borrowed from a Rodger Dodger; redline wheels from Anniversary Red Barons. Resin casting courtesy of a former Mattel employee. 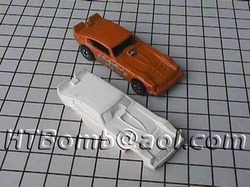 The Vega Bomb was part of the Flying Colors series introduced in 1975 when Mattel eliminated the more expensive Spectraflame paint from their lineup. On the plus side many cars featured tampo printed graphics that added a nice flair. It's amazing how many people worked for Mattel and managed to keep some really good stuff!! I snapped this photo back in 1970 at our local Chrysler Plymouth dealership during the travelling Rapid Transit Show. Don Prudhomme's Snake funny car along with its rival, The Mongoose, was part of a famous rivalry. 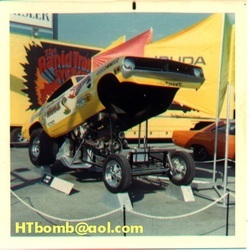 Mattel was drag racing's first corporate sponsor. 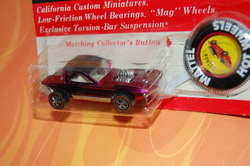 The Hot Wheel's versions were a hit and it was a win win situation. Our very own nitty gritty kitty. He loved to watch us play with Hot Wheels. We miss you Kirby.